Not all men, tired of always wearing trousers, think the traditional kilt is the best skirted garment, not even if their motives are exactly the same, the unique freedom, more variety to an otherwise somewhat boring wardrobe, health aspects and the difference it makes, being just little bit different. They might prefer a garment less Scottish and with fewer rules to follow. Or they may already be wearing traditional kilts, just wanting also other options, depending of situation or task to do. Allready mentioned vendors, Kilt Society and Scotweb, will also deliver you a solid coloured, otherwise traditional kilt, as well as tweed kilts. By Scotweb you can also buy some nice made-to-measure Camouflage Casual Kilts in four different patterns. The price is only £125 delivered at your door step (comes with free worldwide shipping). Or a Denim Casual Kilt. Paul Henry Kilts (England) can not only make you a traditional tartan kilt sewn by hand but also kilts in tweed, linen, denim, and cotton. An old solid coloured kilt, 4 yard. Solid black kilt, white kilt socks. A cheap solid coloured green kilt from Tartanista. A canvas kilt. The vendor does not exist aby longer. Top quality reflected in price. Going for something even more casual, easier to maintain, something not connected with rules for wearing and with no need for special accessories? 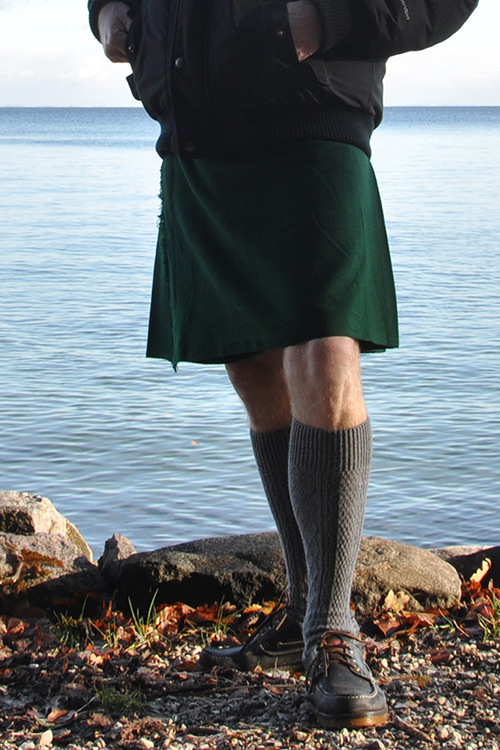 A utility kilt might be what you are after. 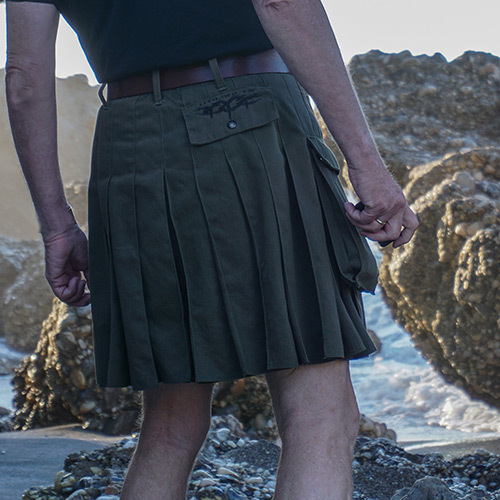 The utility kilt is less than 20 years on the market. 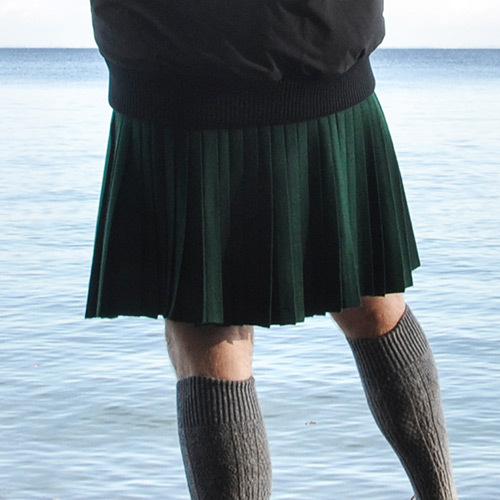 In 2000 Steven Villegas, founder of Utilikilts.com in Seattle, launched a skirted garment for men. He positioned it as a kilt and named it Utilikilt. It soon proved successful, competitors emerged and the modern kilt or contemporary kilt was a reality. 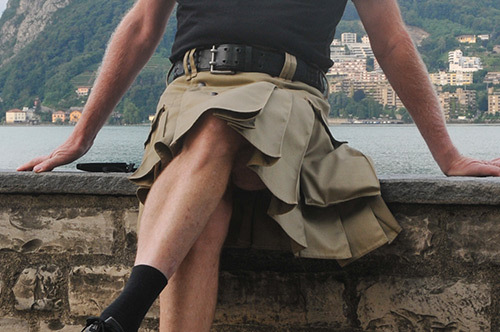 Today these kilts are often referred to as utility kilts. Neither the Utilikilt itself nor its competitors had or have much resemblance with traditional kilts. They do have pleats on the back and a front apron which, however, is narrow compared with that of a traditional kilt. Where the latter is a 9-15 o’clock thing, it is on utility kilts rather 10 to 14 or 10.30 to 13.30 only. They are solid coloured or camo, made of cotton or denim instead of wool, and last not least they have big pockets, typically of the cargo type. Due to their construction they are closed by means of buttons, rather than buckles and straps. Therefore they do not have the flexibility in waist size, known from the traditional kilt. They will go into the washing machine, however, which is a good thing. With a few exceptions these kilts have blue jeans functions. Despite no tartans and different in design these kilts have also become popular with men of Scottish descent, which to me indicates that to them the kilt as a garment may be more important than heritage. And nothing wrong about that. Today the Utilikilt has gained almost iconic status. And prices have increased. The cheapest Utilikilt, the Mocker, is $200. All pictures above show the Original Utilikilt which is no longer available. I prefer that over the new “swichback”-design, but judge yourself. If the new one sells better, it is better. As much as I like these kilts, as much would I prefer that they came with less pockets – if any – and that they would have less metal buttons - if any. Probably the intention has been to give the skirted garment a manlier note. But a traditional kilt, which definitely is regarded manly, has none of this kind. Therefore I like the Utilikilt Mocker with its inside slide pockets. A somewhat forgotten brand is Amerikilt, being almost as long on the market as the Utilikilt. It comes in three lengths, short 20”, medium 22” and long 24”, and in three colours, black, olive and saffron. It is made from 10oz 100% Cotton Duck. 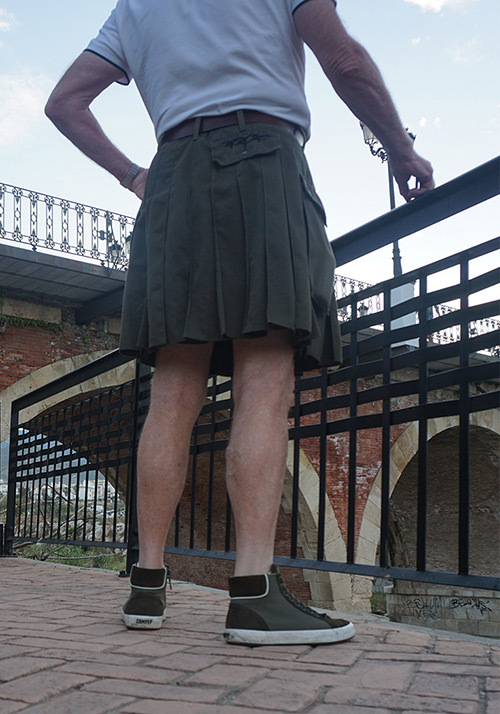 Instead of cargo pockets it is delivered with a detachable roomy sporran in the same fabric and colour as the kilt. And it is only $109. Customers would say it twinkled, and they were right. That was my experience, too. But some also said that when it had been washed a couple of times, it was much better. They were right, too. It is. I have come to like my Amerikilt. Amerikilt Olive, worn with tights. The increasing prices on Utilikilts and other premium brands and the fact that a market for this type of kilts exists has opened up for a segment of cheap utility kilts, typically made in Pakistan and China. They are sold by several kilt shops in America and Scotland. The quality is not on the same level as for example the Utilikilt but certainly not bad. They often come in a lot of different designs, many of them, however, not being ones that most men would wear. 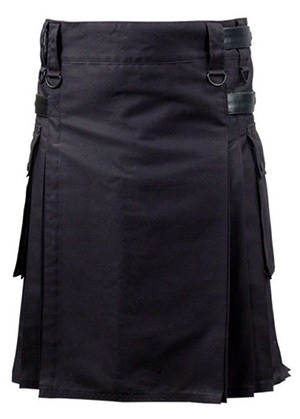 When you buy a low priced utility kilt from a vendor in USA, UK or where ever, you don't know who has manufactured it. Chances are it comes from Expo International, only one, however, of several B2B manufacturers, all of them concentrated in the city of Sialkot in Northern Pakistan. 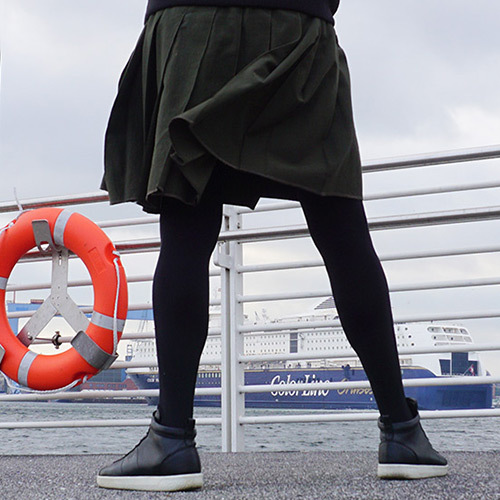 The picture shows one of the Expo International utility kilts, which I'll wear a lot. No rules exist. Utilikilts and Amerikilt are available in different lengths, as mentioned above. 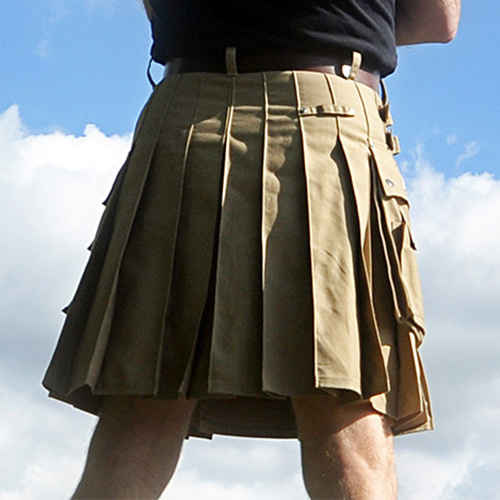 Affordable utility kilts, however, mostly have the standard 24" drop, despite a utility kilt might sit lower on the hips than a traditional one. But now with some American vendors you can actually have affordable kilts made to your wishes. One possibility is Kilt & Jacks. This and other kilts from Kilts&Jacks are available in many colours and in waist sizes from 24” to 42” or 61-107 cm. Lengths from 17” to 32” (43-81 cm) without paying extra. And even shorter or longer is possible at an additional fee. So no rules, why don’t experiment a little bit? Have it cover your knees or have it end above them? Just be aware that too long looks femme, too short girlish. 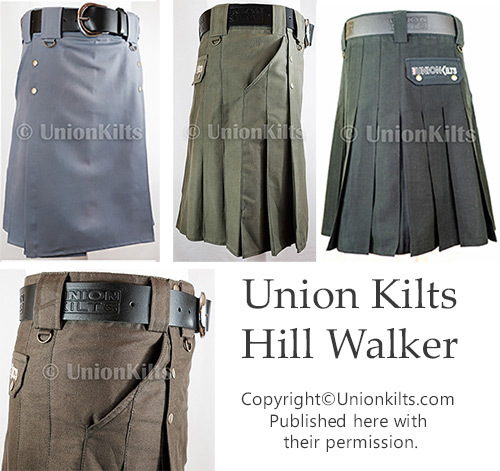 Union Kilts, a British enterprise, has launched a kilt with slide pockets, called Hill Walker. It has two trouser front pockets, comes in four different colours and with a 23" standard drop, which I prefer over the 24" seen on most other utility kilts. Judged from pictures the Hill Walker seems to be a high quality kilt. And then there is the price, no more than £50. Only freight comes on top (as long as Brexit is not effective). It looks like a bargain. No rules. No need for a sporran. The only thing needed might be a wide belt. In summer it is easy. Short socks or no socks look great. But when it’s cold? The natural thing to wear would be kilt hose. But if you don’t wear a traditional kilt, you won’t have them. They also offer some really long socks, 45” = 114 cm which shall certainly look like tights or leggings. So obviously they are manly enough, at least according to the Utilikilt people. No socks, short socks, knee high socks, pulled up or scrunched down, kilt hose, tights or leggings, it all seems to work. But judge by yourself, and wear what you like. Boots, heavy shoes and sneakers look better than dress shoes with a utility kilt.